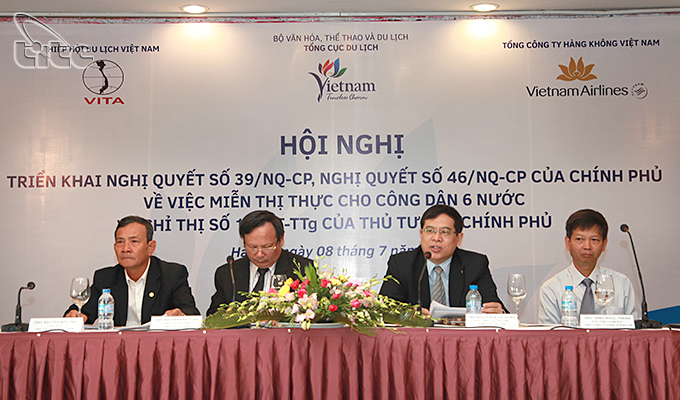 In the framework of activities of the 55th anniversary of Viet Nam tourism industry, Viet Nam National Administration of Tourism (VNAT) coordinated with the Viet Nam Tourism Association (VITA) and Vietnam Airlines to hold a conference on implementing Resolutions No.46/NQ-CP and No.39/NQ-CP on visa exemption for citizens of 6 countries (the UK, France, Germany, Spain, Italy and Belarus) and Directive 14/CT–TTg. At the conference, contents of Prime Minister’s Directive No.14/CT-TTg and Action Plan of Ministry of Culture, Sports and Tourism on strengthening effectiveness of state management, focusing overcome weaknesses and promoting tourism development were introduced to the participants. The Directive concentrated on key issues: price management; social security; civilized behavior; environmental protection; and food safety. To utilize policy of visa exemption for citizens of 6 countries, VNAT had worked with the Spanish, British, French, Italian and Belarusian Embassies in Viet Nam; will coordinate with Viet Nam’s representative offices overseas to propaganda on visa exemption policy of Vietnamese government, organize presstrips to explore Viet Nam, participate in World Travel Market 2015 in London…In addition, VNAT will also coordinate with VITA and Vietnam Airlines to implement tourism stimulus program for 6 above markets in the coming time.